> Since time immemorial we humans have been living with the seas and from their bounty. They provide us with food, mineral resources, transportation routes and other services. The climate-regulating effect of the oceans and the biochemical processes that take place in the sea are of fundamental importance. Today, some of these services are under threat, which is why it is time to develop approaches for more sustainable use of the seas. 2.1 > A ceramic figure from the fifth century BC. 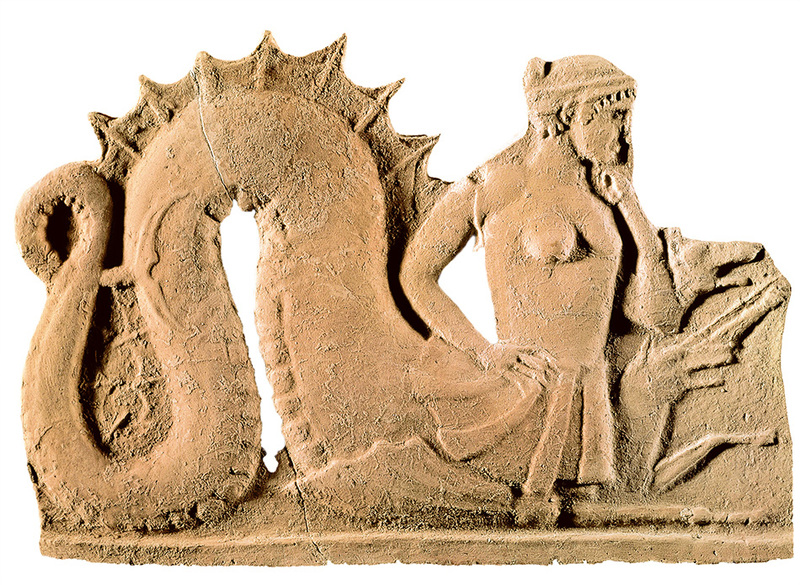 Mythical figures like the Greek sea monster Scylla were popular motifs for the decoration of everyday objects. For millennia the sea seemed infinitely vast. Coastal dwellers, fishers and seafarers perceived it as overpowering and even threatening although it was the basis of their livelihoods. Myths of sea monsters and sea gods grew up around its unfathomable depths. In most countries and regions, the sea has long been demystified, and it is becoming apparent that the oceans are by no means as invulnerable as our forebears believed – on the contrary: today humans are influencing and harming the ocean. We are dischar­ging toxic substances and excessive nutrients into the sea and plundering fish stocks. Due to emissions of the greenhouse gas carbon di-oxide, large volumes of which dissolve in seawater, humans are even beginning to alter the chemistry of the water masses. Many climate researchers believe that as the atmosphere and the ocean undergo warming, ocean currents will shift in future, resulting in changing weather conditions on land. The human-induced – anthropogenic – changes taking place in the sea, the atmosphere and on land are so far-reaching that in the year 2000, scientists working with the meteorologist Paul Crutzen suggested considering the era since the beginning of the Industrial Revolution as a human-influenced geological epoch in its own right. Crutzen, one of the researchers who discovered the hole in the ozone layer, aptly names this epoch the age of humans, or the Anthropocene (from the Greek word ánthrõpos: human). – and the trend is rising. At the same time the mineral oil industry is con­quer- ing the last bastion of the marine environment: the deep-water and ultra-deep-water zones at depths of 400 and 1500 metres respectively. 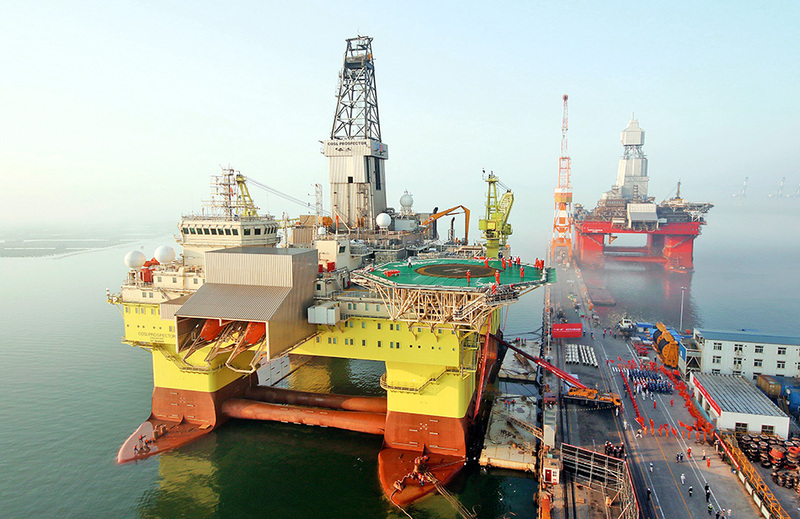 Around 10 per cent of the petroleum drilled worldwide is currently recovered from such great depths. The sums invested by mineral oil corporations for offshore oil extraction are correspondingly high. 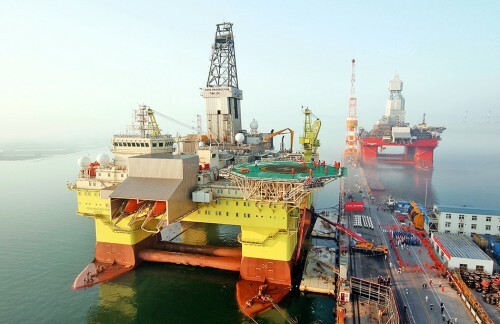 2.2 > The deep-water docks of Chinese company CIMC Raffles in Shandong Province. Up to nine drilling rigs at a time can dock at this pier, showing the vast scale on which deep-sea drilling of natural gas and petroleum now operates. ”: deposits which formed around hot volcanic vents on the sea floor and are rich in precious metals. , some of which are high in metal content and even contain larger quan-tities of certain metals overall than equivalent mineral deposits on land, are further attractions of the deep sea. The first heavy underwater vehicles are currently being built for ocean mining.
. 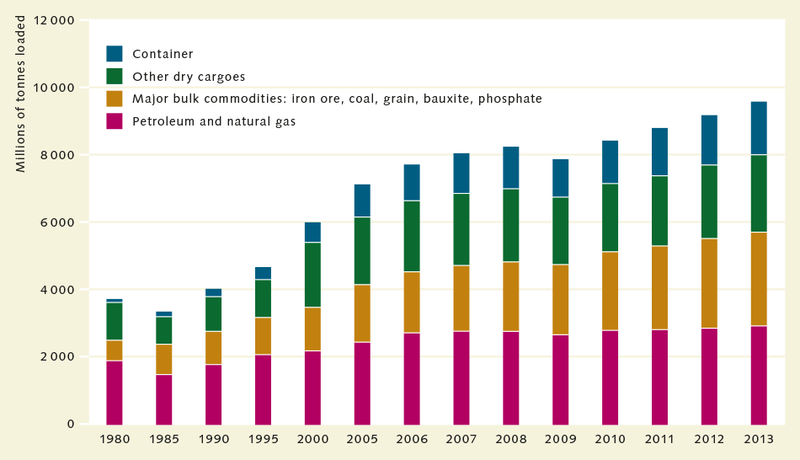 Ships move more commodities than any other means of transportation. And unlike land-based roads where tolls are often payable, the trading routes across the open ocean are available for free. Ships carry petroleum, coal, ores and grain around the world. Container-loads of electrical appli­ances, clothing and foods are sent from Asia to North America and Europe. Crude oil from the Persian Gulf or South America is shipped in oil tankers. Apart from a decline in the cargo statistics during the economic crisis in 2008 and 2009, the quantity of goods transported by ships since the mid-1980s has constantly grown – from around 3.3 billion tonnes in 1985 to around 9.6 billion tonnes in 2013. Some 620 000 ships’ officers are employed in sea travel alone. Added to these are many millions of people who work as sailors or dockers. Above all, the sea coasts exert a special appeal to human beings. It is not by chance that many major cities, like Hong Kong, New York or Singapore, are in coastal loca­tions. Numerous industrial plants have been and are being constructed by the sea, because raw materials and goods can be delivered and dispatched rapidly across the water. Experts estimate that today 41 per cent of the global population lives no more than 100 kilometres from the sea. The United Nations believes that this figure is likely to rise further in future. In many regions, it is also boosted by the millions of domestic tourists who seek out the coasts for bathing and recreation. 2.3 > The oceans are the world’s most important transportation routes. 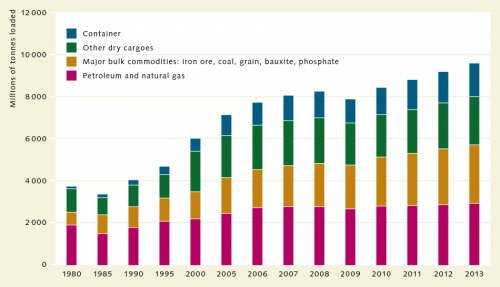 The volume of seaborne cargoes continues to rise since the 1980s. The sea’s most important living resource, from the human viewpoint, is fish. According to estimates by the Food and Agriculture Organization of the United Nations (FAO), today the livelihoods of 600 to 820 million people worldwide depend directly or indirectly upon fisheries. These people include fishers’ families and suppliers – the makers of fishing equipment, for instance. Moreover, fish is the principal component of food in many places and a very important source of protein. Overall, about 20 per cent of humankind’s nutritional needs are met from the sea. Apart from fish, crustaceans and bivalves, people also consume algae and jellyfish. As pressure on the sea continues to grow, the question arises of how any sustainable use of the oceans could be achieved under these circumstances. Normally sustainabil- ity theories refer to the situation on land, where critical issues quickly become evident. If the effluent from a mine contaminates rivers and soils for a long period, for exam-ple, then there are people directly affected whose usage or property rights are infringed. Damage is normally directly visible or at least measurable. It is also obvious right away who the beneficiary is. This means that interest groups can be clearly defined, conflicts aired and negotiations conducted about a sustainable use of natural resources. Processes in the sea remain invisible to most people, however, and are difficult to bring to light. For example, at the mouth of the Mississippi in the Gulf of Mexico, a 20 000-square-kilometre dead zone has formed in recent years which is almost devoid of oxygen. It has been caused by large quantities of nutrients discharged by agriculture into the river and then carried into the coastal region. In the sea, nutrients lead to rampant algal growth. When the algae die, they sink into the deeper water layers and are broken down by bacteria in a process which consumes oxygen. 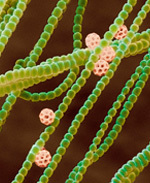 When the algae multiply especially quickly, the microbial degradation gradually exhausts all the oxygen. For higher organisms such as fish, crustaceans, bivalves and molluscs, this is disastrous: either they flee, or they die of oxygen starvation. Humans living on land barely notice any of this – with the exception of a few fishers whose fishing grounds have shrunk or shifted due to the expansion of the dead zone. The second major difference from land is that continuous sea areas extend beyond national borders or are even – like the high seas – international areas. Ocean sustainability can therefore only be achieved if numerous nations pull together. So today it is necessary to find new approaches for sustainable ocean use which are interna-tionally applicable above all else. 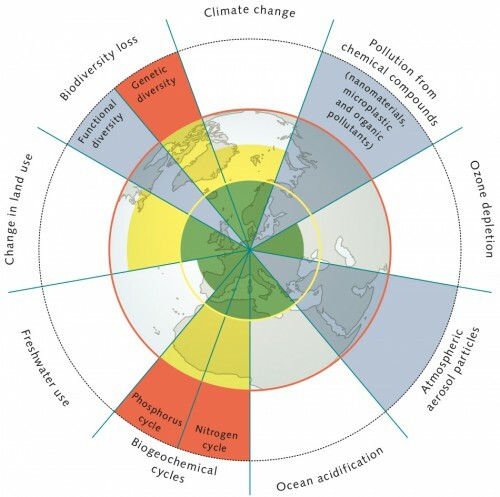 An accessible approach that is currently inspiring the international sustainability debate, and which combines the terrestrial and marine realms, is the concept of planetary boundaries. To develop this concept, which was first published in 2009 in the scientific journal Nature and updated in 2015 in Science magazine, an international Swedish-led research team asked itself how potentially catastrophic environmental changes could be avoided in future. For this purpose they defined nine essential environmental dimensions, or Earth system processes, such as climate change, freshwater consumption or ocean acidification. For seven of these dimensions – based on existing and to some extent provisional calculations – the researchers were able to quantify critical limits. If these were exceeded, they say, it could result in grave global or regional environmental changes – with unforeseeable consequences for life on Earth. In the scientists’ view, this applies particularly to climate change and bio-diversity loss. 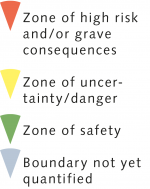 In order to illustrate the potential hazards of crossing the thresholds, for every dimension three levels of risk are specified: the first is a zone of safety; the second is a zone of uncertainty or danger which indicates that the risk of grave effects is rising; and the third zone signals a high risk of grave effects or that such effects have already occurred. Large-scale extinction of different organisms, for example, is already taking place and is clearly irreversible. 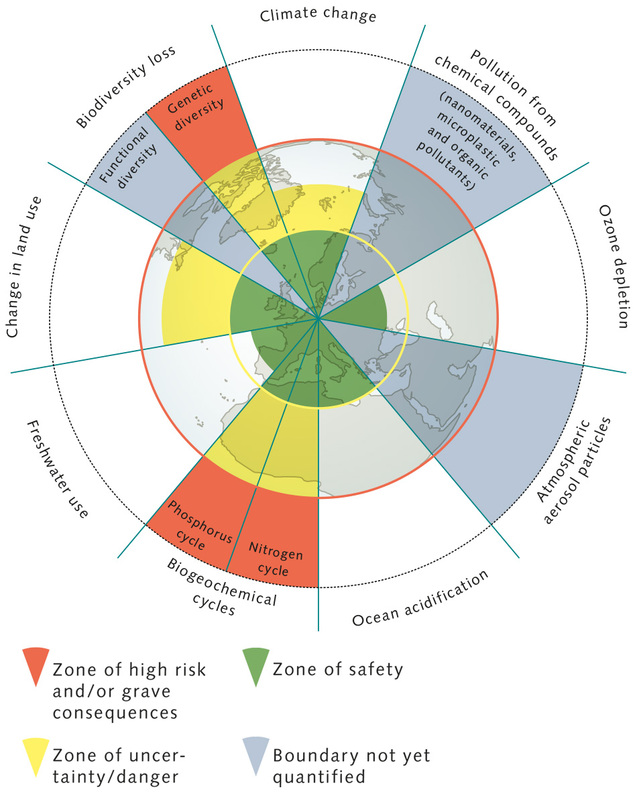 2.4 > The planetary boundaries model makes it clear how excessively humankind is overusing resources. The different colours indicate the status of the individual environmental dimensions.